It’s not the first time I’ve featured an inspiring quote from Brooke of World of Wanderlust. I came across this quote at the end of 2014, when I was sitting down reviewing my past year and planning my goals for the new year. And since then, this quote has stuck with me. As much as we deny it, we’re all afraid of failing, as society deems it wrong, making us feel hopeless that once we fail we can no longer succeed or achieve our goals. Well, the successful ones and ones that live out their dreams, don’t get their without failing, learning from their mistakes and becoming stronger. Failing motivates you, gives you a drive you didn’t have before, and pushes you to prove others, and yourself, wrong. In light of the end of January, the first month of the new year, where most have given up on their resolutions or goals, I thought these words were perfect. So what you’ve gotten off track with your diet or haven’t taken any action in trying new things. So what, it’s only been a month! You have 11 more months, 334 more days to make change happen. To be happy, successful, loving – whatever you set out for 2015. 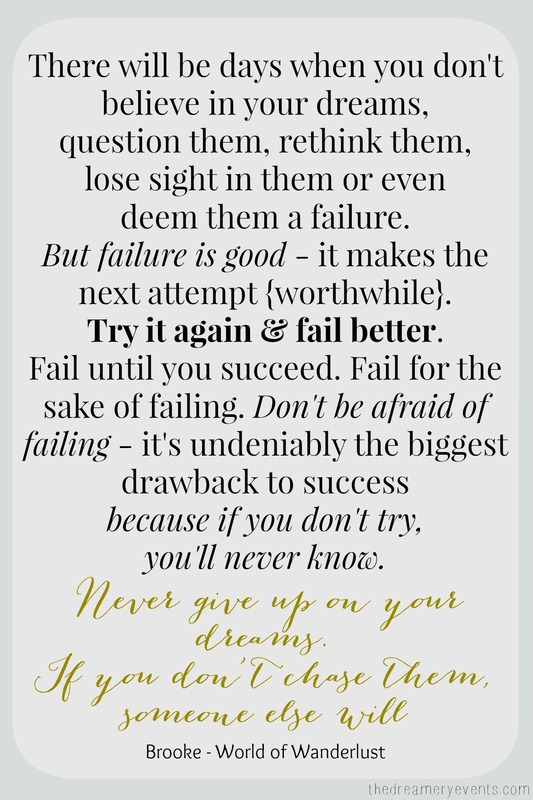 So fail, fail hard because it will make all your achievements much more rewarding!